The freedom that online publishing can afford webcomic creators is one of the most powerful aspects of the medium: Though many webcomics can be—and eventually are—published in physical formats, releasing content online first allows creators to build up a following, a stable fan base that shows up at conventions and buys merchandise online to prove the ability of a book to make money. Ryan Estrada is no stranger to the many ways this road to publishing can take shape; his project Broken Telephone (self-published) is a webcomic that’s already complete at 240 pages, with a new page going up every day for several more months. People can read what’s been released so far on the website, or purchase a digital copy of the complete comic if the need to binge can’t wait. Estrada and the rest of the creative team funded the entire endeavor with a successful Kickstarter campaign back in 2013, which goes to show just how much effort and time it can take to bring an ambitious project like this to life. Broken Telephone features six core story arcs, each one told with internally consistent chronology, though it’s unclear at first if they are concurrent or not. Each arc is split into three distinct sections, and each section is illustrated by a different artist. With 18 artists total, not to mention coloring assistance from two more, the book could quickly fall apart under its own visual weight. Instead, the changes keep each chapter of the story distinct and fresh, though there are moments when small details can become briefly distracting because of inconsistency across art styles; in particular, one of the characters sports a tattoo that is simple in one chapter’s cartoonish, bright panels but sharp and elaborate in another chapter. Despite this, the characters themselves are visually unique enough to be easily identifiable throughout the story. It’s clear that Estrada worked closely with his collaborators to ensure some sense of harmony, though all 18 have distinct styles and color palettes of their own. Readers of other webcomics may know them by different names, but Rachel Dukes, Brittney Sabo, Irena Freitas, Carolyn Nowak, E.A. Dench, K.C. Green, Amanda Lafrenais, Justin Peterson, Elias Ericson, Dan Ciurczak and colorist J.R. Robinson, Kelly Bastow and colorist Jonathan Godfrey, Will Kirkby, Jemma Salume, Chad Thomas, Maya Kern, Tauhid Bondia, and Matt Cummings all do an excellent job with the intriguing story that Estrada has laid out. Estrada even contributes art for one of the chapters himself. A combination of comic and activity book, José Domingo’s Pablo & Jane And The Hot Air Contraption (Flying Eye Books) is a perfect vehicle for Domingo’s isometric composition. The book follows Pablo and Jane, two siblings who, along with a talking mouse named Dr. Jules, are transported to the Monster Dimension in the “hot air contraption” after an evil cat sabotages it. The bulk of the book is composed of their adventures in the Monster Dimension, and it’s up to the reader to help them discover the missing components of their machine. In this way, the book functions similarly to the old Where In The World Is Carmen Sandiego? game. The reader becomes an actor in the proceedings and it’s up to them to discover the missing machine parts before flipping to the next page. Domingo, whose work is as richly detailed as it is cartoonish and stylized, is well suited to a conceit like this, and his compositions provide much for the eye to explore. Immortal India, for example, is bursting with characters—demons and monkeys and deities with comically oversized facial hair—and it’s a genuine challenge to uncover the missing levers and gears. But, while the book is geared toward younger readers, the density of Domingo’s cartooning makes the activity section a more compelling read than the bookends, whose pages are organized like more conventional comics. The conceit of interactivity is a trick. Readers who play along—regardless of whether or not they have any interest in actually finding the parts—are forced to read the entire page. Domingo tricks them into drinking in the entirety of his images and studying in detail, first as a whole and then, slowly, in pieces. It slows down the reader and forces an appreciation of Domingo’s labored-over cartooning. In 1983 Steve Gallacci self-published the first issue of Albedo Anthropomorphics. This series is generally credited with starting the trend of adult-themed “funny animal” stories, which continued throughout the ’80s and into the early ’90s. (This series also bears some responsibility for helping to organize the still-nascent furry fandom movement.) A year later this trend would crest with the invention of the Teenage Mutant Ninja Turtles, originally a spoof of Marvel’s Daredevil (Frank Miller’s run specifically) and X-Men. The appeal of taking talking animals—a comics staple since Mickey and Donald were first smuggled onto the page—and putting them into decidedly non-cute circumstances has never really faded, as the continued success of Elephantmen and Howard The Duck illustrates. Of the initial wave of ’80s funny animal books, Usagi Yojimbo has had by far the most respectable comics career. 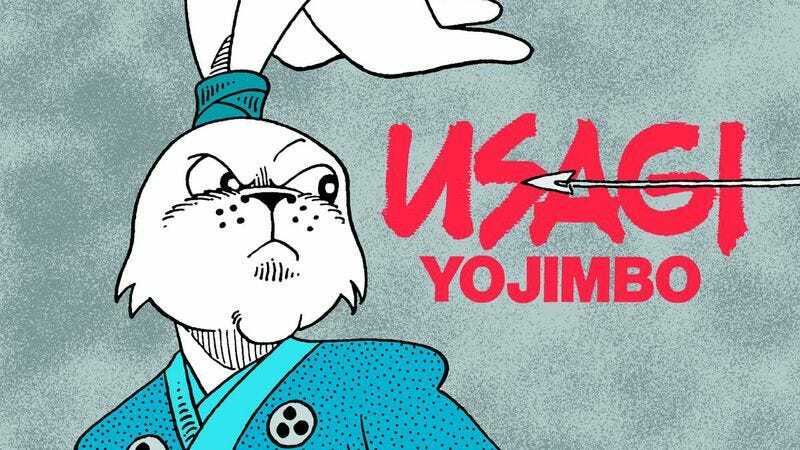 Based loosely on the life of 17th century samurai Miyamoto Musashi, Usagi is a painstakingly researched depiction of late-medieval Japan, albeit with talking rabbits, rhinos, pigs, and snakes in place of humans. While the Turtles went on to international fame and fortune, Usagi—only about half a year younger than the Turtles, both having premiered in 1984—never really left comics. Despite appearing on the Turtles’ own TV show and toy line a few times (thanks to being pals with Eastman and Laird), he’s never had any significant media presence. But whereas the Turtles have been, at times, a sporadic presence in the comics market, and have passed through many hands, Usagi has remained under the stewardship of his creator, Stan Sakai, for 31 years. Looking over the strip’s earliest passages, what sticks out to the reader is just how well defined Sakai’s style was almost from the very beginning. Although the early Usagi looked a bit different, with a triangular head as opposed to his later round appearance, the contours of the strip are substantively the same. The first few stories, reprinted from Albedo, are short and episodic, but as soon as the feature had a consistent outlet it soon began to accrue extended storylines and continuity, with recurring characters and enemies. Sakai’s draftsmanship changes from early, technically proficient but crowded layouts, to the more relaxed and flowing line he retains to this day. It’s hard not to see the influence of Sergio Aragonés as the series progresses and his figures become looser and more expressive—Sakai has lettered Aragonés’ Groo for over 30 years as well, after all. Children’s textbooks can learn a lot from Maris Wicks’ Human Body Theater (First Second), a new educational graphic novel that makes biology fun and engaging through colorful, adorable visuals and a casual, light-hearted writing style. Labeled as a “non-fiction revue,” the story is presented as a stage production with various players, led by a skeleton that becomes more fully formed as it breaks down different parts of the human body. While its primary function is to educate, the revue angle brings a strong focus on entertainment, and Wicks takes advantage of the visual medium to give the scientific information extra character. It’s well past time that comic books and graphic novels became commonplace in classrooms, and they’re especially valuable tools for beginning readers, providing visual reference points and breaking down information into individual panels that are easier to absorb. Anthropomorphizing body parts amplifies the cute factor of Wicks’ graphic novel, but more importantly, it creates individual characters that recur throughout the book, making it easier for readers to remember different kinds of cells, organs, and bacteria by giving them a distinct visual identity that reappears whenever they are mentioned. Pages of text describing how oxygen travels through the body or how food turns into waste don’t have the same appeal to kids as comic-book sequences that break down those processes with visuals, and Wicks’ impeccably clear sequential storytelling and medical illustrations give the book significant value for children who can’t read yet. “The Dance Of The Oxygen Fairies” is an exceptional example of how Wicks condenses information in a visually dynamic way, and “The Chorus Line Of Infectious Organisms” highlights the personality Wicks brings to her microscopic cast with bold designs for bacteria, virus, protozoa, and fungi (which all have long legs in fishnet tights because they’re a chorus line).